...a valuable introductory book for students, Western or otherwise, in Asian studies. It is timely that a sophisticated discussion of modernity and postmodernity be introduced to Asian Studies, and this text clearly offers a beginning of such an enterprise. Understanding contemporary Asian societies and cultures is not merely a matter of knowing when to bow and how low. Asia looks beyond the clichés and stereotypes to explore the cultural dynamics of the region. 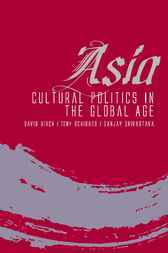 The authors show that there is no one 'Asian' culture, but rather a number of experiences and influences which affect societies in the Asian region in different ways. They explore the ongoing impact of the colonial era and examine how current global trends intersect with local traditions and histories. Drawing upon recent advances in critical communication and cultural studies, the authors engage with the cultural politics of information and the public sphere, diasporic movements, religion, the position of women, masculinity and sexuality, providing new insights into contemporary Asian cultures. With examples from countries across the region, Asia provides the tools needed to recognise, understand and discuss Asian cultures and cultural difference.